The problem is, when I kill 2 mobs, say chickens, in a really short time, it only gives me one gold. I tried a faster clock, and it didn't work at all. And if I changes the /scoreboard players set @p KillCount 0 to /scoreboard players remove @p Killcount 1, the system gets stuck. And if you were asking, Healthbar displays my gold. Please help in any way you can! I'd call it Anime and Justice League: A "Blocky" Ball-Kicking Adventure of Absolute Randomness!!! You need a command block to reset the repeater to unpowered mode using the /setblock command so it will reset on the /testfor. If that doesn't work I can't help you. It didn't work. 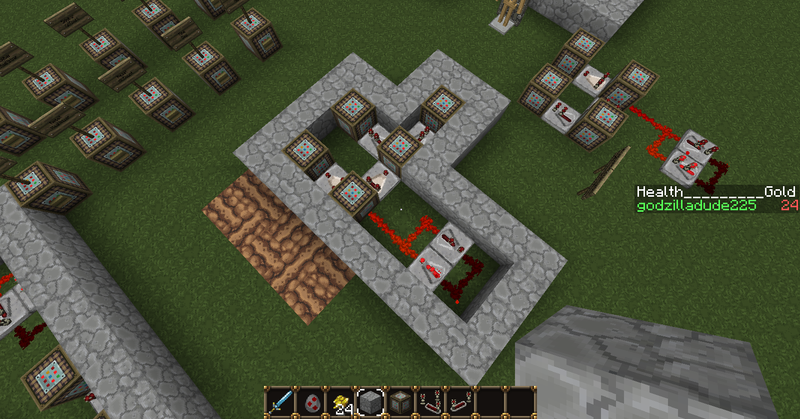 What happens is that the redstone goes through it's circuit while I'm killing the second mob. 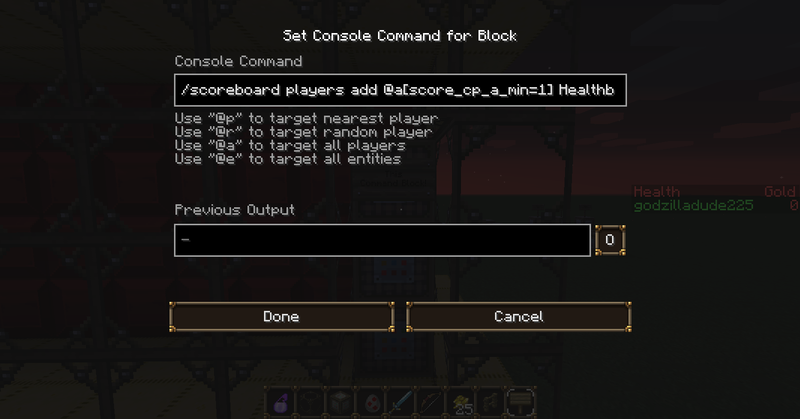 I didn't see how changing the repeaters were going to make things faster from the start, but replacing the command block with another command block with the same command was close, so thank you for the idea! Just a thought, would it be somehow possible to replace /scoreboard players set @p KillCount 0 with /scoreboard players remove @p KillCount 1 and then just have the circuit run 2 times through? I've tried that, but the circuit always gets stuck. try using a fill clock to test your commands here do this. 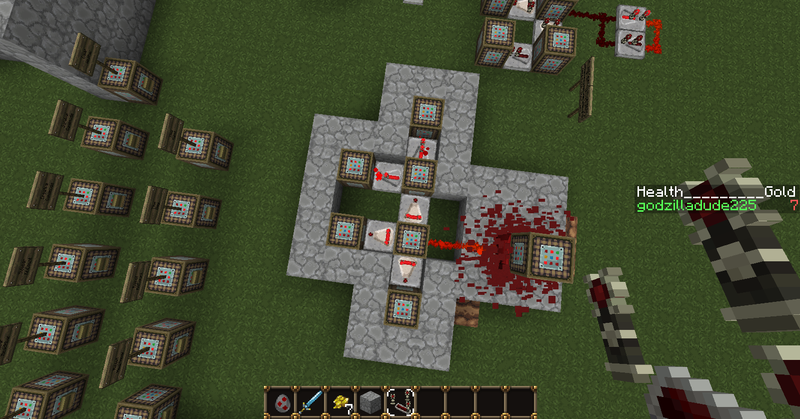 place a redstone block in the middle of the 2 comman blocks. after doing that try and break your chain of redstone blocks...you cant its a clock. 20/second. your outputs are the redstone blocks. Ever heard of a setblock clock? If not, definitely look it up. It goes 20 times a second!!! No way will you miss a mob with a clock that fast! A quick search will teach you how to make one. Why are you using comparators? How much do you know about /execute? Execute can be used like a testfor and a command in one (if you know how to do it right). I'd suggest looking into it. Nope. /scoreboard players reset @p KillCount was no different than /scoreboard players set @p KillCount 0. That is not true. Reset will remove the player from being tracked by the scoreboard entirely. Meaning any and every single target selector containing that scoreboard check, no matter the numbers, will never select someone who has had their score reset. Setting to 0 keeps them tracked on the scoreboard with a score of 0. I can't find a way to open it. What software am I supposed to use? Sorry, I didn't try it out yet. I've been playing another game. 😁 I'll try it out now! I can see why your title is The Meaning of Life, the Universe, and Everything. IT WORKS!!!! I never understood how those one-command functions worked, though. Thank you so much!!! 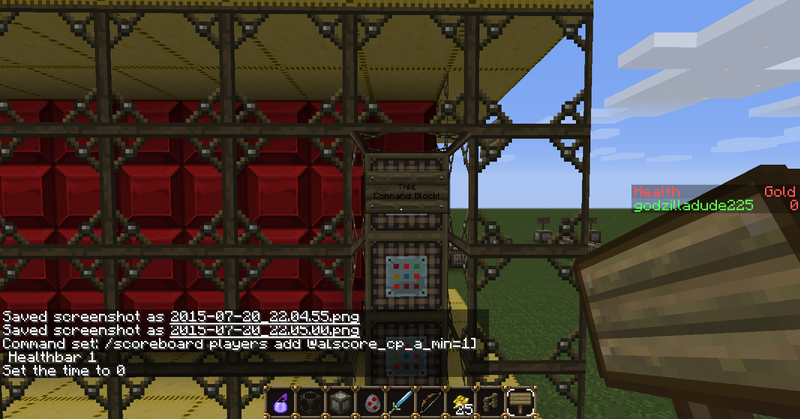 If you have time, please check out my other thread, Minecraft Armor Stand Scoreboard System Problem. Thanks again! EDIT: I actually have 1 bug. I have a scoreboard called Healthbar that tells me how much gold I have (yes, and my health). Could you tell me where to put /scoreboard players add @p Healthbar 1 so it only activs when I kill a mob? Thanks! Sorry to bug you further, but this is pretty strange. It's not working. I put in the exact command you used in the screenshot. EDIT:I figured it out. The reason it's not adding a score is because it adding 1 to cp_a while at the same time setting it to 0. Lol. I was just happy that something worked for once.